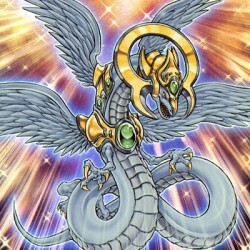 When this card is Normal or Special Summoned: You can activate 1 of these effects:- You can destroy Spell/Trap Cards on the field up to the number of other "HERO" monsters you control:- Add 1 "HERO" m..
Once per turn: You can reveal 1 Fusion Monster from your Extra Deck, then send 1 of the Fusion Material Monsters listed on that card from your Main Deck to the Graveyard; this card's name becomes the ..
You can reveal this card in your hand; send the top card of your Deck to the Graveyard, then, if it was a monster, inflict damage to your opponent equal to its Level x 200 and Special Summon this card..
Durine either players turn, as Chain Link 3 or higher: You can Special Summon this card from your hand. Spell Cards that have been activated are banished instead of being sent to the Graveyard. The AT.. When this card is Summoned, it is changed to Defense Position. When a face-up monster you control is selected as an attack target, you can change the target to this card. When this card is selected as..
"Elemental HERO Avian" + "Elemental HERO Burstinatrix" + " Elemental HERO Clayman" + "Elemental HERO Bubbleman". Must be Fusion Summoned and cannot be Special Summoned by other ways. While face-up on ..
"Elemental HERO Neos" + "Rainbow Dragon" or "Rainbow Dark Dragon". Must be Fusion Summoned with the above Fusion Material Monsters and cannot be Special Summoned by other ways. Once per turn: You can..
Must be Fusion Summoned using any 5 "Neos", "Neo Space", "Neo-Spacian", or "HERO" monsters, including at least 1 "Neos" or "Neo Space" monster, 1 "Neo-Spacian" monster, and 1 "HERO" monster, and canno..
Banish, from your side of the field or your Graveyard, the Fusion Material Monsters that are listed on an "Elemental HERO" Fusion Monster Card, then Special Summon that Fusion Monster from your Extra ..
Banish "H - Heated Heart", "E - Emergency Call", "R - Righteous Justice" and "O - Oversoul" from your Graveyard: Special Summon 1 "Elemental HERO" Normal Monster from your Deck. All "Elemental HERO" N..
Pay 1000 Life Points; Special Summon 1 Level 5 or lower Fusion Monster from your Extra Deck. (This Special Summon is treated as a Fusion Summon). The Fusion Monster Special Summoned by this effect can..